One of the most mesmerizing segments of every Ackerman Gala is what President Lois Braverman refers to as “teachable moments.” It is during this moment in the evening when the audience gets an insider’s view on the work, the thinking, and the intellectual capital of the Institute. This year was no exception, and perhaps it raised the bar for “teachable moments” for Galas to come. Lois Braverman took the podium and showed the audience scenes from some contemporary films. She proceeded to breakdown the hidden meanings inside the scenes, and what they revealed about families and human relationships. It was fascinating, and it led directly to a brand new moment in the Gala agenda: the first ever Ackerman Institute Media Award. The award goes to someone in the media who has pioneered and advanced our thinking about families and family relationships. The first honoree was Christine Vachon, the celebrated, independent film producer of such esteemed movies as Boys Don’t Cry, Far From Heaven, and Mildred Pierce. By design, it was from two of Ms. Vachon’s films that Lois drew her scenes for the teachable moments. 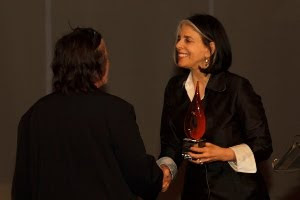 The Ackerman Institute Media Award is a powerful new step for the Institute, as it draws the connection between family issues and American culture. Ms. Vachon is the distinguished first recipient, and her work is consistent with the teaching and research that is done at the Institute. This evening you’ve heard the phrase, “Moving Families Forward.” This is Ackerman: we move families forward…towards better communication, deeper understanding of one another, and stronger, healthier relationships. Here we have an elegant, poised older woman and an alienated, vulnerable younger woman who is on the verge of joining the family. The young woman’s own mother doesn’t even recognize her on the phone, doesn’t even remember her birthday. So it’s easy for her to idealize, and envy, the Jane Alexander character, the matriarch. But what things look like on the outside, and what is true, are always two different things. Being emotionally healthy will never be the same for any two people, or marriages, or families. From the Children and Relational Trauma Center to The Gender and Family Project, at Ackerman, we recognize and cherish the fact that every family has its own contradictions, its own rituals, its own hurdles. This is the very first step in Moving Families Forward. And there’s nothing like a good movie to make you laugh, cry, squirm, and above all…THINK. Or RE-THINK…your position. We understand ourselves by understanding our family—our biological family as well as our emotional family. At Ackerman we help family members put those disparate pieces together into a coherent picture. So, as we expand our notion of who our family is, we expand our understanding of ourselves: Where did I come from? From a sperm donor? An egg donor? A surrogate? Am I the product of those who raised me, and how I was brought up? Or am I the product of the genes I’ve inherited? Or a bit of both? And on the adoption front, with the opening of the records, people are increasingly making the connection to their biological family members, and that goes in both directions: children seeking biological parents, biological parents seeking children who they gave up. WHO IS FAMILY?…is an ongoing conversation at Ackerman; a challenging, nuanced conversation that is one of the reasons why our clients come to us. What is clearly evident in her films is Christine’s vision of the infinite shades of gray that color our understanding of family. Her films are often brutally honest about the struggles that individuals face when their family connections are broken. In her career, she has pioneered films that have given us a window into the lives of people who have been marginalized by a “dimension of difference”: be it race, class, gender, sexual preference, or disability. At the same time, her films celebrate the potential for understanding and for change. 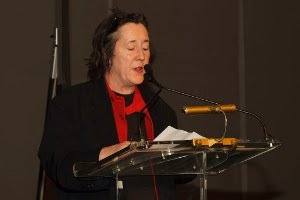 For her fierce compassion for our differences, and her daring sensitivity in stretching how families are portrayed in our culture, I am very pleased and proud to present the Ackerman Institute’s first-ever “Families in Media Award” to Christine Vachon. Thank you, Lois. I began my career making films for marginalized communities. Stories by, for, and of people who were misunderstood and outside the mainstream. So much of that has changed. WE have changed, as an industry of artists, and as a society. And change is hard. The world resists change, so it takes the brave and the enlightened to lead the charge toward change. The animated video that showed earlier tonight ends with the words “When people feel understood, they soar.” And that is something that I have looked for in all the movies I’ve produced a sense of understanding. When we can understand, we can change. And change is the way of all things. So the things I hear tonight make me proud to be your first media honoree. When you talk about expanding our ideas about what makes a family, and healing broken spirits without regard for some prehistoric notion of “normal,” well, I know I am in the company of kindred spirits. When I hear that Ackerman is deeply focused on serving the very people who might never have access to these world- class services, I know I am in the right place. And to learn that all of you are here tonight, giving generously to continue Ackerman’s mission of “moving families forward,” this award takes on added meaning. So thank you, for this honor, and much more, for all that you are doing to expansively embrace the complexity of the human experience. Thank you.